After five years of intensive development, trials and evaluation by Lakota elders, linguists, local artists and teachers, Red Cloud’s Lakota Language Program is now providing culturally responsive language instruction to all students, from kindergarten through high school. And today, the project is gaining crucial insight from the one of its more important stakeholders: a student. It all started when Bianca Spotted Thunder, a senior this year, started working with classmate Kristian Big Crow on his business plan for a Lakota Language App in Red Cloud’s entrepreneurship class. Watching that work unfold, Principal Robin Johnson suggested Bianca take her love of the language to the Lakota Language Project’s on-site coordinator, Melissa Strickland and serve as a work study student. For Bianca, it’s an opportunity to support the preservation of her heritage language. For Bianca and her family, the use and understanding of Lakȟóta relates directly to their cultural identity. Her father, a wičháša wakȟáŋ or medicine man, uses the language during sacred ceremonies. 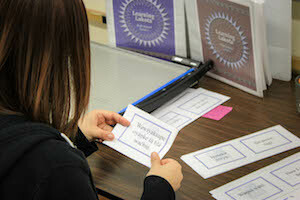 The solution, Bianca believes, lies in initiatives like Red Cloud’s Lakota Language Program. She’s been filling her semester-long work study project by helping Melissa and the LLP team correct and refine materials like flashcards and online multimedia lessons, and translating and developing Lakȟóta signage for The Heritage Center—Red Cloud’s renowned Native art gallery and gift shop. 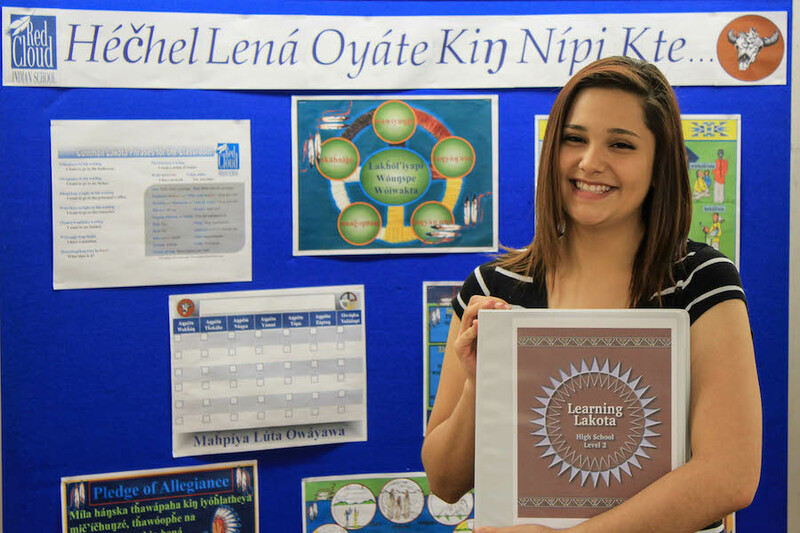 While she recognizes the immense value in supporting language revitalization efforts in an academic setting, Bianca believes she’s also developed real, transferable skills that will shape her future. Bianca had originally planned to attend cosmetology school this fall, however, after her time as a work study student, she’s decided to postpone those plans to explore a different path. While the long hours and hard work of teaching might dissuade some people, Bianca says that she likes helping people and thinks that, as an educator, she would be able to connect with people and inspire them in the way she has been inspired at Red Cloud.